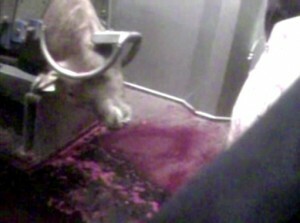 As there is little footage of ritual slaughter in the Netherlands and to show the regular procedure for religious slaughter without stunning, the NGPF commisioned undercover filming in Dutch slaughter houses. The NGPF created a visual document in which this footage is commented on by leading scientists in the fields of slaughter methods and religious slaughter. The visual document was presented during a special procedural meeting in the Lower House, where the Party for the Animals has argued for stunning before animals are ritually slaughtered for years now. For decades scientific research has existed that shows indisputably that animals suffer severe pain and stress during ritual slaughter without stunning. In various countries like Sweden, Norway, Estonia, Iceland and Switzerland ritual slaughter without stunning has been banned.